i mailed three sets of three flower blocks yesterday — across Lake Michigan, across the Pacific, and across the Hudson. I made nine star blocks to donate this month. I love these 9 patch centers! I too love the nine patch centers. These are an inspiration! 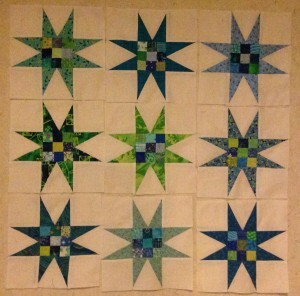 Truth to tell, I made the first six blocks with “regular” 9-patch centers — that is, each had four squares of one fabric and four squares of another fabric — all from my stash of 3.5″ 9-patches from the Block Swappers’ quarterly swap. THEN I re-read Sophie’s instructions and learned that the centers of these blocks must be made with at least four different fabrics. A little ripping and a little sewing were in order. Good thing I’m in another swap for 1.5″ squares so I had many from which to choose.